Introducing our new 8″ and 11″ Kids drum kits. For years we have been providing the most amazing adult sized 12″ and 14″ drum kits and now by popular demand we have geared up and are now offering a new line of Kids drum kits. 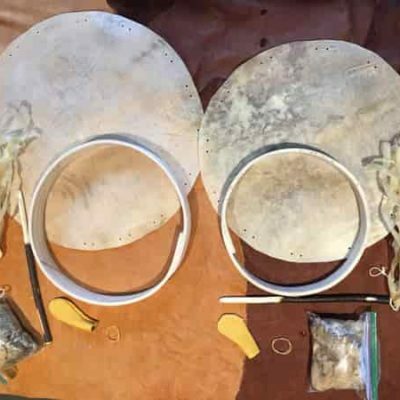 Like our adult drums, each kit includes a hand steamed white ash hoop, a deer hide with holes punched large enough to wrap all the way over to the back of the frame. Lacing long enough to tie up the drum and weave a handle, a drum stick kit AND instructions to help anyone, even a complete beginner pull an amazing drum. Our kits include an amazing instruction manual, a rawhide circle (large enough to wrap all the way over to the back of the drum) with holes punched, lacing long enough to pull the drum and weave a handle, one of our steamed white ash hoops, and a drum stick kit…which includes a moose leather head (to be sewn with the included glovers needle and sinew), sheep’s wool, maple stick and sinew/needle to tie it on. We are very used to dealing with small or huge orders.